Having caught the bug to photograph old buildings I headed off to my old haunt of Sheffield today to take a look at one of the areas that still has it’s roots back in the days of cutlery of the mid to late 1800s. The area around Milton Street / Egerton Road is steeped in history and the grade II listed buildings that still stand appear to be in their original state – now housing workshops and offices. Some of the sections of the Beehive Works have been vandalised with graffiti and broken glass is scattered along the narrow Egerton Road. While tragic the scars bring a sense of beauty to the eye of the photographer. I spent a good hour or so wandering around the small but amply photograph-able area. 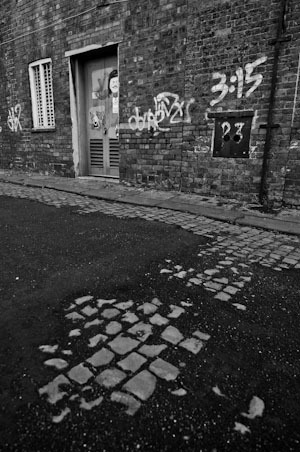 In this shot I included a patch of the eroded tarmac that gives us a glimpse of the original cobbled stones below.